A city map of Tehran during the reign of the Shah. The Complete Map of Tehran. 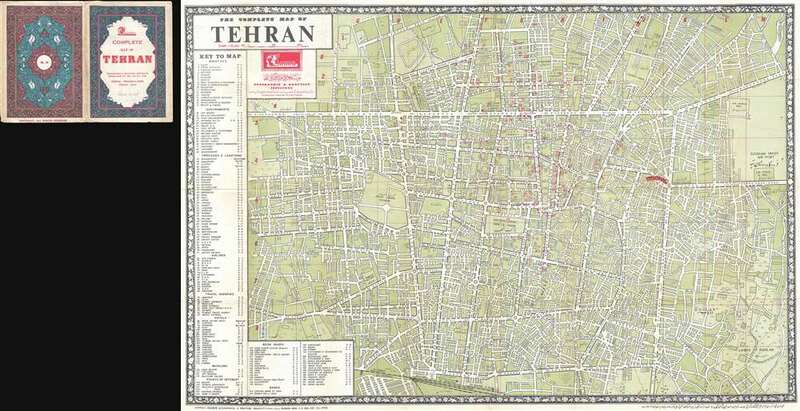 This is a 1963 Addass Sahab bilingual city map or plan of Tehran. The map depicts the city from Kh. Karoun to the Lands of Doulab and Doshan Tapeh Airport and from Kh. Chehel Metri to Kh. Shoosh and the Tehran Railway Station. Highly detailed, myriad streets are labeled throughout the city in Farsi and English. 162 locations are numerically identified, including embassies, government ministries and buildings, hotels, museums, bookshops, and banks, and correspond with a key situated along the left border. Several other locations, including air force installations, hospitals, factories, and the Par E Shahr are labeled on the map itself. This map was published in 1963, the height of the reign of Mohammad Reza Shah, the last Shah of Iran. Reza launched a series of progressive reforms, known as the White Revolution, which included the controversial move of giving women the right to vote. The Shah's regime was overthrown sixteen years later during the Iranian Revolution in 1979. This map is extremely rare, as we have been unable to locate another example. Addass Sahab (1921 – April 2, 2000) was an Iranian cartographer and publisher active in Terhan in middle part of the 20th century. He is considered the 'Father of Iranian Cartography.' Sahab was born in Fam, Tafresh district, Iran. He was the son of Ostad Abolghasem Sahab Tafreshi, an Iranian writer, publisher and, from 1935, founder of the Sahab Drafting and Geographic Institute. This was the first private geographical publisher in modern Iran. The company was soon passed to Addass, under whose guidance the company published over 1500 works, including maps, atlases, prints, scientific, and medical illustrations. Addass himself traveled throughout Iran, often mapping individual towns and adding his own artistic flair to the maps. His most important maps illustrate Tehran, Esfahan, and Mazandaran. He also traveled extensively abroad, producing maps of Afghanistan, Pakistan, Iraq, and Turkey. After his death, the Sahab Drafting and Geographic Institute was taken over by his sons and remains an active concern to this day. Very good. Even overall toning. Wear along original fold lines. Verso repair to fold separation. Blank on verso. Accompanied by original binder.